Union Minister of State (Independent charge) for Power R K Singh has assured that under ‘Pradhan Mantri Sahaj Bijli Har Ghar Yojana’, popularly known as ‘Saubhagya’, will connect 1,41,625 unconnected households of the north-eastern state of Tripura. The Union Minister made this assurance when Tripura Deputy Chief Minister, Jishnu Debbarma, who is also the Power Minister of the State called on him in New Delhi. The Union Minister also said that the fund will be released for procurement of materials. He also said that the fund for ‘Saubhagya’ will also be released at the earliest. Singh further apprised Debbarma that he had already issued instructions to the concerned officials of the Ministry in this regard. During the meeting Tripura’s Deputy Chief Minister demanded for decreasing of rate of power purchased from Bongaigaon thermal power plant in order to reduce tariff burden on the consumers. 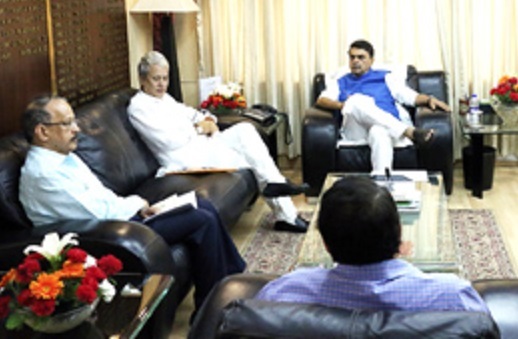 The Union Minister, it is learnt, has also agreed on the demand of the Tripura state government and assured that he will take all possible steps in that regard. Jishnu Debbarma also raised the issue of halting works of power line of 132 kv from Ambassa to Ganacherra, which was held up due to lack of forest clearance and funds. Later, the Union Minister Singh assured that the matter will be expedited and he will clear the matter on top priority basis.